Many Bahamians will stand on a line for 45minutes to an hour in the freezing cold just to have an encounter with the seafood royal. Clean conch by squeezing some lime/lemon juice then wash with water. Using a meat tenderizer/mallet pound conch until thin and tender – avoid breaking apart. Whip eggs, milk and salt. Dip conch in egg mixture; then roll in flour. In a pot, deep fat fryer or frying pan cook conch until golden brown. Tah! Dah! In minutes you are sinking your teeth into this succulent Bahamian seafood king. For a casual meal on a Friday or Saturday night add some French Fries and coleslaw or dinner rolls. For a full dinner heap some peas n’ rice, coleslaw, plantain or green salad. Include a wedge of lemon, tartar sauce, hot sauce and ketchup and just love it! Preparation of this dish is not for the faint or fearful at heart. On the island we dominate our creature they do not dominate us. Trust me the pleasure of eating this dish is far worth the effort it takes to prepare it. Crab preparation: Separate the back of crab from the body with a knife. Using a spoon remove the brown substance from around the interior of the crab (this is a precious commodity called the “crab fat” – so secure it in a bowl for later). Be careful not to burst the bitter gall bag (s small little sac usually hidden under the fat. Discard apron and gills from underneath along with gall and back shell (unless you plan on doing some stuffed crabs later). Clean the crab body, cut into 2-4 pieces depending on size, claw – crack slightly and put aside until later. This coleslaw will add a burst of colour to your plate, like the colour of our Junkanoo Festival and it will be almost as satisfying to your soul. Coleslaw is a regular side dish on many Bahamian tables. So get in the swing and make it a part of your home cooking menu. Combine cabbage, carrots, onion and raisins in a large bowl. Sprinkle sugar, salt and lemon juice into bowl. Add mayonnaise and mix until blended. Chill in refrigerator at least 10 minutes, mix before serving. To add a little more fiesta, chop an apple into fine pieces and add to mixture. pot over medium low heat add cooking oil, flour and salt. Constantly stir mixture allowing to cook until golden brown. Add onion, white pepper and thyme. Continue stirring while onions cook to a tender texture. Add tomatoes and cook until blended. Add water and simmer for 10 minutes. You may adjust thickness at this point by adding more water. Add conch and cook for 30 minutes or until conch is tender. Johnny Cake, Potato Bread or Homemade leaven bread. Chicken for breakfast! Yes even chicken for breakfast in the Bahamas. 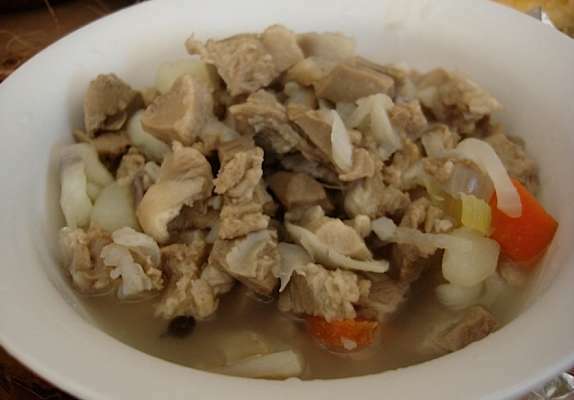 Chicken Souse is eaten for breakfast, lunch, dinner or mid-night snack. We children used to look forward to a bowl of chicken souse with hot grit, Johnny cake or hot homemade rolls for breakfast on Saturday morning. And no one complained if it was on the menu for lunch. After a night out on the town when your energy has been depleted for all that dancing, nothing fortifies you like a bowl of chicken souse. Have it ready when you get home so you won’t have to wait. Many people may say its just boiled chicken, but even in this simple dish there is an art to the preparation to make it just right. I watched Auntie Rie as she routinely set her task in motion. My lord just thinking about it makes my mouth water. Clean chicken thoroughly making sure to remove the blood and entrails. If you do not want the hassle of this cleaning process use the chicken wing or drumlets. Cut chicken into three-inch bite size pieces removing as much of the fat as possible. Combine lemon juice and pepper. Wash chicken then marinade with ¼ cup of lemon juice. Sprinkle with salt and allow to sit for 30 minutes. Using a large (8-10) quart pot over medium heat place chicken into pot and cover with water bring to boil then remove from heat after 5 minute. Throw off the water (this is done to remove oil extracted from the skin of the chicken) leaving chicken in pot. Return pot to stove; cover chicken with onions, potatoes, celery and remaining lemon juice mix. Cover with water about 1 inch above contents and add salt. Bring to boil, cover pot then reduced heat and allow to cook at medium-low heat for 1 hour or until chicken and potatoes are cooked. To avoid over cooking potatoes (based on their size) you may want to add them ½ hour into the cooking process. Adjust seasoning if necessary. Serve with grits, Johnny cake, homemade bread or dinner rolls. Serves 6-8. A Seaman’s breakfast for sure. Boil Fish is a signature dish for the regal archipealego we cal home – The Bahama Islands! Yes to all of our fellow Earthians The Bahamas is made up of over 700 islands, cays and rocks of all shapes and sizes. With oceans all around us it is no wonder we have mastered the preparation of seafood and enjoy it all hours of the day. When Auntie Rie boil fish she selects the larger meatier fish such as: grouper or Hog Snapper but other smaller fish may be used. These are the white, flaky, tender and mild in flavor. Auntie Rie always has the fish man cut her “fish for boil” into 4-6oz pieces (you may keep the bone in or out). The other benefit with using the larger fish is that their bones are big, making it easy to pick them out as you eat. Caution should always be taken when eating fish, because bones may even be present in fillet. I remember many a Saturday morning when I would be helping Auntie Rie make breakfast. She would always say, “A clean fish gives a clean broth”. So I spent the time washing the fish, removing the scales and taking out the remnants of blood from around the bones. Then she told me to place the fish in a bowl of ice water while we prepared the other ingredients. Remove fish from ice water and place in a 6-8 quart pot. Cover fish with onions, Crush 1 hot pepper and combine with limejuice then pour into pot. Add potatoes, bay leaf and water enough to cover fish and 1 teaspoon of salt to start (you may add more salt to taste later). Cook over medium heat until fish and onions are tender (approximately 20 minutes). Remember fish normally takes 15-20 minutes to cook depending on thickness. Your broth should have a tangy, lemony flavour and fish should be tender and firm. Serve 4-6 persons with a wedge of lemon and slice of hot pepper because some like it hotter! Accompaniments: Saturday morning breakfast or anytime of the day on the island you cam find Boil Fish and Grits, Johnny Cake or Potato Bread. Most of my American friends are astonished that we eat fish for breakfast, yet you cannot find a more nutritional, high protein, low-fat, high energy meal anywhere. So if a low-carbohydrate diet is your prescription then enjoy a bowl of Auntie Rie’s Bahamian Boil Fish. Ah Conch, our pearl of the sea. Pronounced (kun’k) this muscle of the sea lives in a shell spun from the granules of sand it processes during its life, thus the pink and pearly whites. Said to be an aphrodisiac and sexual stimulant it is believed to be the cause for the large families our grand parents amassed. A delicacy for sure its succulent meat is craved no matter how it is prepared. I remember as a child spending the summer at my grandparents in Nassau. And I could never understand why mama would have orange rind and this smelly thing hanging from the kitchen window. Then one day I got up the nerve to ask what it was. “Conch“ she said, “Dry conch (cured), I’m going to use that to make soup and conch fritters”. Man, even as I think about it today I’m salivating. To use the cured conch it must be soaked in water over night, then boiled to tenderize. Because of its concentrated and potent flavour, cured conch need not be used in the same quantity as fresh conch. Pass onion, green pepper, hot pepper and conch through a food processor. In a large bowl combine all ingredients including ground conch to form a batter. The batter should be thick enough to drop from a spoon. If it is too runny add a little more flour to stiffen it. A little water would soften it up if too stiff. In a deep fryer or deep depth pot heat oil to 350ºF. PLEASE BE CAREFUL! Using a tablespoon for large fritters or teaspoon for small drop batter into oil; fritter should float to the surface. Use a cooking fork to turn so that they will be golden brown on each side. Remove fritters from oil and place in a pan lined with absorbent paper. Conch fritter batter can be frozen and used later. To reuse remove from freeze and let stand at room temperature for hour or until defrosted. Pour into a large bowl and add 2 tsp of baking powder mix until baking powder is blended. If the consistency is off adjust with flour or water as needed. Please note that you may need to add seasoning to adjust flavour also. Blend until smooth. Chill and serve on side. SOUL FOOD RECIPES FROM THE BAHAMAS & THE CARIBBEAN START COOKING SOUL FOOD AND DRINK WE LOVE. Recipes from Bahamas that is what we have. Soul Food and drink from Auntie Rie’s kitchen. So you ready to start cooking some of our good old native Bahamian soul food recipes? This island breeze makes you want some of Auntie Rie’s scrumptious soul food dishes. Yes, this is our Bahamian thing. Me and Auntie Rie right here looking out over the sea deciding what fish we were going to send the boys to go fish for you all today. There is nothing like some good old soul food home cooking: a nice fresh grouper, some small frying snapper, tuna steaks, mahi mahi, baked bonefish, cracked conch with some Peas ‘n’ rice, plantain, cole slaw or potato salad on the side uuumm uuumm, I could taste it now. You cannot get healthier soul food recipes than the ones we are going to share with you. 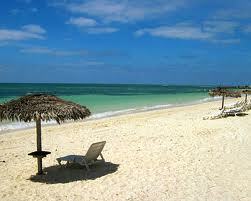 My dear, we are going to have a goodtime cooking up some good old Bahamian soul food recipes. On a hot day like this you have to get yourself a big glass of switcher with ice, for all you non-Bahamians that is what we call our lemonade. But we don’t put our umbrellas in the glass, we put our glass under the umbrella along side a lounge chair or hammock and drink in the ocean breeze while we decide which Bahamian soul food recipe we will prepare that day . Now what makes our homemade recipes from Bahamas so special is that our culture is a melting pot of many nations and people. Yes sir, we international. We got African, European, German, Italian, Greek, Spanish, Canadian, American and every bit of the Caribbean mixed all up in here. And we are a creative group of people, especially when it comes to our soul food cooking. God has given us a gift to tantalize the pallet. So I know you are going to enjoy cooking up all of our Bahamian soul food recipes. We will show you how to turn your Christmas and Thanksgiving dinners into a homemade Bahamian feast. Here in the Bahamas we look for any occasion to wipe up one of our delicious soul food dishes. For us life is to be celebrated and every party must have soul food. So as you prepare to create one of my recipes from Bahamas make sure you set the mood; turn on some good Bahamian music, put on you your Androsia sun dress and apron and sing, dance and enjoy the moment. Believe it or not this is the secret to what makes Bahamian soul food so mouthwatering, lip smacking good. We have a number of Soul food Bahamian breakfast, lunch and dinner recipes that are sure to make your family say, “Uumm yeah man dis gooood!” We also have recipes from Cuba,Haiti,Jamaica,Puerto Rico, and much more. If you are “sweet mouth’ (an take a delight in sweet foods), you will love our soul food desserts, pastries and breads: things like guava, raisin and coconut duff, coconut tart, Benny cake, banana bread, potato bread and you have to try that homemade Johnny Cake. In the preparation of these soul food meals we will use specific ingredients, but don’t worry many of them can be found on your grocers’ self. I am going to share some of Auntie Rie’s secret recipes and techniques also, but you have to promise not to tell. Ok I know you maybe saying to yourself, why should I purchase Auntie Rie’s Soul Food recipes from Bahamas when I can get one free at another site? How would you feel if you spent your time and resource preparing a dish only to find out that because of one missing ingredient the dish is ruined? In the preparation of Bahamian Soul food every ingredient and technique is important to the final outcome. Would you prefer to get a recipe from someone who prepares that item everyday or someone who tasted it once or twice and borrowed the recipe? Wouldn’t it be nice to have suggestions on complementary dishes and accompaniments as well? Ok I thought so. Well come on then lets get to cooking some good ole Bahamian Soul Food recipes.